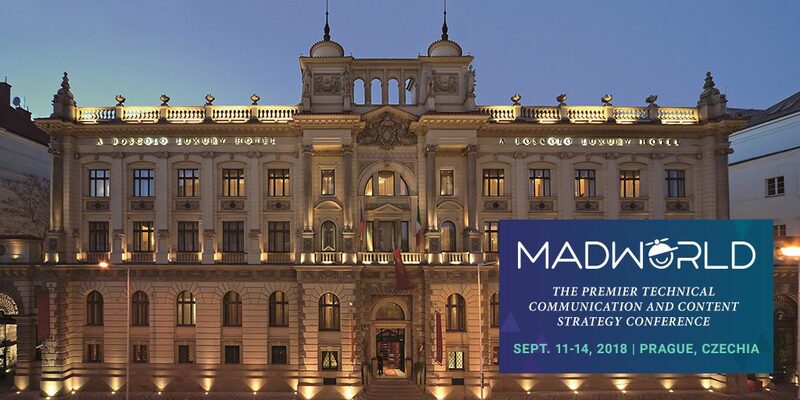 In one month, technical writers and communication specialists from around the European region will gather at MadWorld Europe 2018, debuting in Prague, Czechia. Over the course of the conference, attendees will have the chance to learn from industry thought leaders and experts from leading organizations, who are ready to share their experience and best practices. And with 20 thought-provoking sessions to choose from, there’s plenty of topics and insights to discuss throughout the conference. We’re thrilled Ellis Pratt as a MadWorld speaker, a thought leader and veteran presenter on trends in technical communication. In our first speaker highlight post, we speak to Ellis and what attendees can expect from his upcoming sessions. Ellis Pratt is a Consulting Technical Communicator and Director at Cherryleaf, a technical writing services company. He has been working in technical communication since the early 1990s. He has a degree in Business Studies, and is a member of organizations such as the Institute of Scientific and Technical Communicators, the Institution of Engineering and Technology and the ISTC Management Council. In 2017, he was listed as one of the top 25 Content Experience influencers in the world. In addition, Ellis was a contributor to two books: Current Practices and Trends in Technical Communication, and The Language of Technical Communication. Hi Ellis! We’re excited to have you at MadWorld Europe 2018. Can you give us a sneak preview of what to expect in your sessions? Thank you. I’m in the Vendor Neutral track, so we won’t be down in the weeds of the products. It will be more about dealing with some of the issues that face a lot of technical communicators – getting the work done on time, and dealing with the changes to how software is developed these days. What does Agile development mean to you, and why it’s important to technical writers? Agile is a methodology that helps avoid spending years on a project, only to find no one wants what’s been created. It’s a different way of working that should bring issues to the front early on, and force them to be fixed. Of course, there are teams that try to avoid those hard issues, and who aren’t really doing Agile. What have been the biggest challenges for technical communicators who are working with an Agile methodology? The original Agile methodology didn’t cover how to create end-user documentation, so technical communicators have been trying to work out the best way to do their work. My presentation on Technical Authoring in an Agile World shares some of the ideas and approaches we’ve come across. How can technical writers adapt to the frequent product releases and updates that come with agile development? This is one of the challenges. The iterative process can mean specifications can change quickly, and there’s very tight deadlines. You have to be closely involved in the project so that you know when things are changing, and develop processes that mean you and the development teams can work as smoothly as possible. Do you have any tips for technical writers that are working in an agile environment? Look at Agile’s roots. It’s based on the Lean methodology. By knowing a little about Lean, you can understand the context for the elements within Agile. Seeing Prague – I’ve never been before. I’m also excited to see the presentations from the other speakers. From my experience of the MadWorld conferences in San Diego, I know their quality will be top. In addition, I’m looking forward to meeting the MadWorld attendees, chatting and sharing ideas with them. I know I’ll come back with a long list of ideas and actions to take in the following months. If you’d like to learn more about Agile from Ellis, and the rest of the experts at MadWorld Europe, there’s still time to register. And if you missed out on your previous chance to save on registration – the final discount deadline has been extended to August 17, where you can save up to $200 USD on MadWorld Europe. See you in September in Prague!